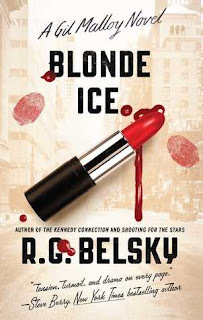 From the author of the “thought-provoking thriller” (Jan Burke) The Kennedy Connection comes a gripping mystery featuring crime-stopper and star Daily News reporter Gil Malloy who takes on his most explosive and exciting story yet—a blonde femme fatale in New York City who is killing men for thrills. What an enjoyable read! I loved the pace of the story and found Blonde Ice to be incredibly hard to put down. The reader follows along as Gil Mallow, reporter for the New York Daily News is pulled into a murder case by a female serial killer. Time after time I thought I had figured out who the killer was, but I never found out the real truth until the very end. I love when a story is twisted, complex, and impossible to guess the ending. There were portions of the story that became a little drawn out, but they didn't last long and the action kicked right back up in the next chapter. Blonde Ice was different than most crime fiction I've read because even though Gil was chasing a serial killer, there was still a jovial feeling to the novel. There were many serious parts, but Gil always managed to turn things around for a laugh or two. I felt like I was reading an episode of SVU with a comedy mixed in. Blonde Ice is an action packed crime novel that is impossible to put down. From the moment I read the first page I knew I needed to go ahead and clear my calendar for the rest of the day. I would highly recommend this book to readers who enjoy crime fiction with a touch of romance. Thank you Atria Books for sharing such a fun read!